Wednesday April 20 1910 I did some baking in the forenoon. Will did not feel well and was lying down. In the afternoon he cleaned up where the stone fountain was and put seed on it. I helped him some. I got supper over and Ott came out at 7.30. Will was away and we spent the evening in a confidential talk. Will and I talked over some matters for the house after that. 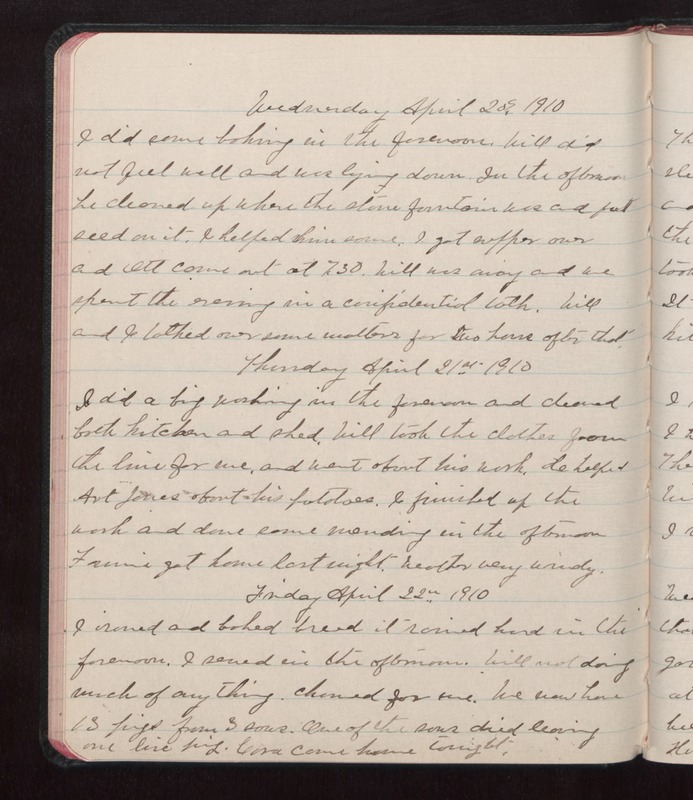 Thursday April 21 1910 I did a big washing in the forenoon and cleaned both kitchen and shed. Will took the clothes from the line for me. and went about his work. He helped Art Jones about his potatoes. I finished up the work and done some mending in the afternoon Fannie got home last night. Weather very windy. Friday April 22 1910 I ironed and baked bread it rained hard in the forenoon. I sewed in the afternoon. Will not doing much of anything. churned for me. We now have 13 pigs from 3 sows. One of the sows died leaving one live pig. Cora came home tonight.